Published by NOAA (The National Oceanic and Atmospheric Administration) as a global value every hour. The level of activity in the Earth’s geomagnetic field is represented by an indicator in the range of 1-3 (Green), 4-6 (Yellow) and 6-9 (Red). The highest levels of activity can generate large signals that are seen across the QuakeFinder network. The Kp indicators are spaced one hour apart and are proportionally taller for higher levels of activity. These are the same as the KP markers on the Daily Pulse Plot, only there are 32x as many on the plot. This is a compound Marker that is overlaid onto the geophone trace. In the example above, several m5+ plus earthquakes are shown. The magnitude is written at the top of the plot, and in this example there are two reports in the ANSS catalog, and therefore two markers are drawn here almost on top of each other. The diamond gets larger for larger quakes, but range, depths, and compass bearing are also given by the mark. Range to an earthquake is depicted by the ladder rungs rising above the diamond, in this case the quake is 44 Km from the site. Each ladder rungs denotes 10 Km. Depth is depicted by the down ladder rungs, each also 10 Km spaced. Compass bearing is shown by the lines angled down to the left, in this case the earthquake is to the Southwest of the site. Sometimes multiple quakes occur in rapid succession, and on the scale of 32 days, their markers are so close together that they overwrite each other. This is normal behavior. These are the red, green, and blue horizontal lines that indicate the triggering pulse counts that will alert the QuakeFinder team. These are the red, green, and blue signals that sometimes cross the Pulse Count Limits. These events are know as “Limit Excursions” and they are reported into a database and to the QuakeFinder team. Vertical ticks are added to the traces to indicate that indeed the database entries were made. Published by NOAA (The National Oceanic and Atmospheric Administration) as a global value every hour. The level of activity in the Earth’s geomagnetic field is represented by an indicator in the range of 1-3 (Green), 4-6 (Yellow) and 6-9 (Red). The highest levels of activity can generate large signals that are seen across the QuakeFinder network. The Kp indicators are spaced one hour apart and are proportionally taller for higher levels of activity. This is a compound Marker that is overlaid onto the geophone trace. In the example above, an m4.5 earthquake is shown. The magnitude is written at the top of the plot, and in this example there are two reports in the ANSS catalog, and therefore two markers are drawn here almost on top of each other. The diamond gets larger for larger quakes, but range, depths, and compass bearing are also given by the mark. Range to an earthquake is depicted by the ladder rungs rising above the diamond, in this case the quake is 44 Km from the site. Each ladder rungs denotes 10 Km. Depth is depicted by the down ladder rungs, each also 10 Km spaced. Compass bearing is shown by the lines angled down to the left, in this case the earthquake is to the Southwest of the site. These are tiny diamonds overlaid onto the waveform data. They indicate the that automated detection of a pulse in the data has occurred. See the discussion below for a more complete detection of what a pulse is and how it is detected. 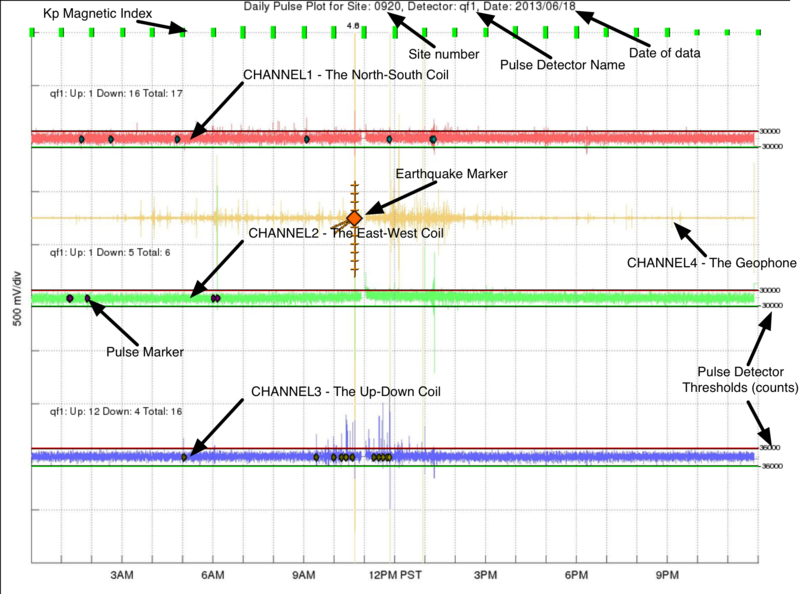 For each channel, a pulse count summary is provided up and to the left of the trace. As an example, the annotation for the Blue trace reads ‘qf1: Up: 12 Down : 4 Total: 16. It means that there are sixteen diamonds total overlaid on the blue trace Twelve of them are “Up” pulses, meaning that they protrude up from the signal waveform in the positive direction (up on the plot). The other four pulses are “Down” pulses, meaning that they protrude in the negative (down) direction on the plot. These are the Red (high) and Green (low) above and below the waveform data. These serve as a general visual guide as to whether the waveform has risen high (or low) enough to trigger detailed analysis of the pulse. Not all waveforms that cross these thresholds are cataloged. Some have too short (or too long) a duration. Others are bi-polar (see below). Note also that the small number to the right end of the threshold lines. This is the actual threshold value in 24bit ADC counts, where the range of possible values is 0-2^24. In addition to these overlays, the title of the plot contains the number of the QuakeFinder site, in this case 0920, the pulse detector name ‘qf1′, and the date, ’2013/06/18′. + – The pulse detector threshold. T0 – The start time of the pulse. 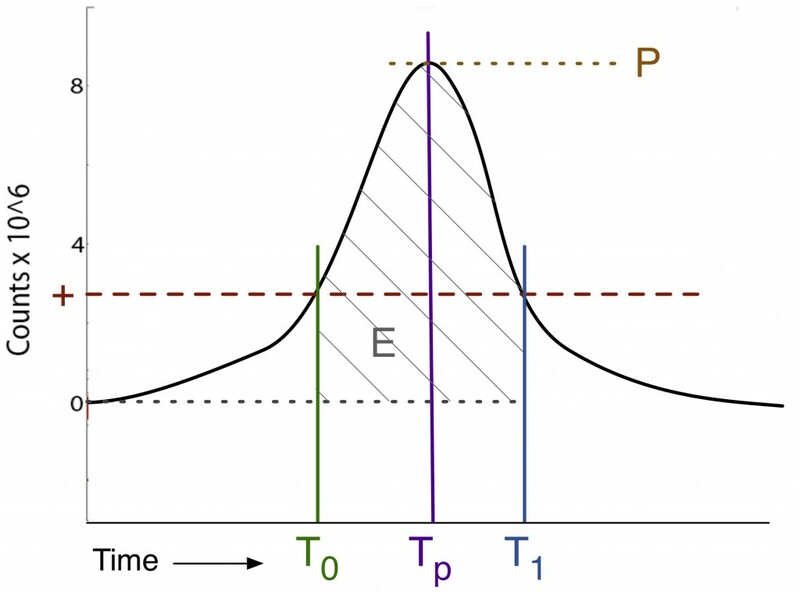 TP – The time of the peak of the pulse. T1 – The end time of the pulse. P – The peak amplitude of the pulse. E – The energy of the pulse. 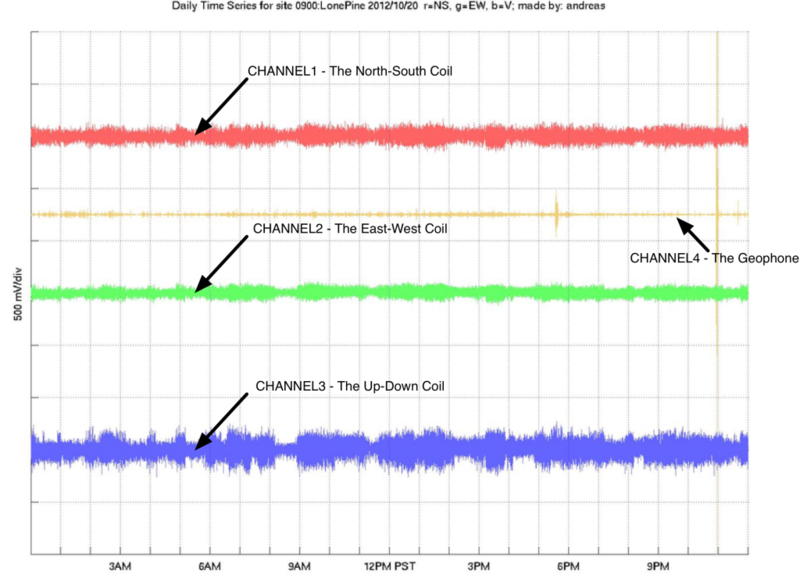 The QuakeFinder Daily Time Series plot shows the three raw magnetometer signals from each site for 24 hours. The plots are all aligned on Pacific Standard Time midnight, which is eight hours behind Greenwich Mean Time. 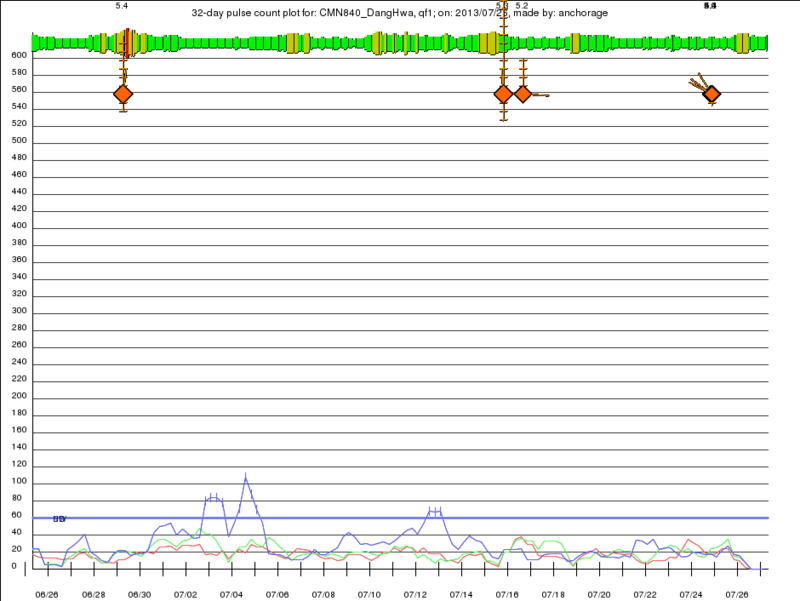 Therefore a plot for March 20, 2013 would span from GMT 2013/03/20 08:00:00 to 2013/03/21 08:00:00 on its horizontal axis. The timestamps on the bottom horizontal axis are in the PST time zone (not daylight savings time). The vertical axis of the plot is scaled in volts, where each division is 500 millivolts, or 0.5 volts. The signals have been deliberately offset so as not to be drawn on top of each other, therefore no hard voltage values are listed on the left axis. Plot trace colors are listed in the order of a computer monitor for easy remembering. Channels 1/2/3 = R/G/B. The Y-axis is 500mv/division (scaled to show some detail in the trace). 1 Volt represents approximately 1 nT (1000pT). 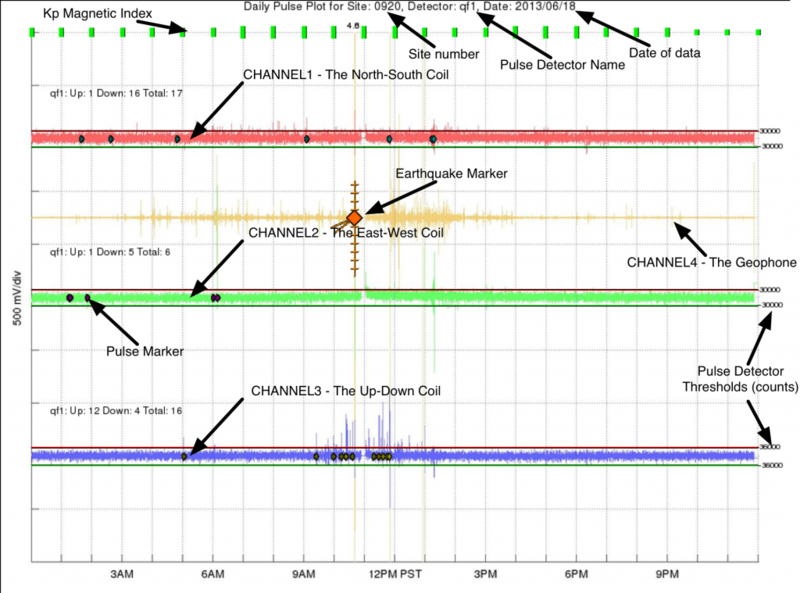 The gold trace shows the geophone signal, and often a large shaking from a car or an earthquake will be accompanied by signals in the magnetometers. Sometimes there are gaps in the data, caused by a reboot, power outage, etc. These are seen as thin straight lines and the absence of signal.